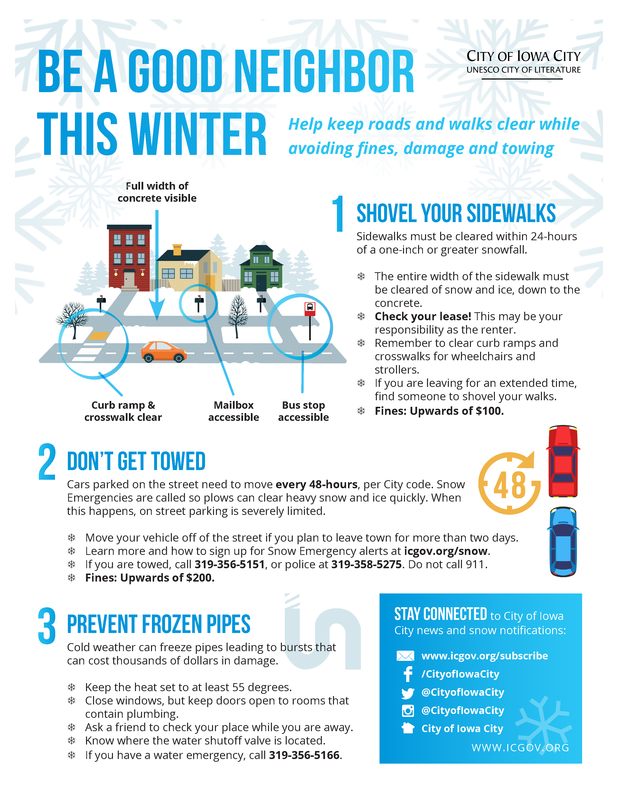 The City of Iowa City encourages you to be a good neighbor when managing your property. Select one of the topics below to learn about your responsibilities as a property owner in Iowa City. Renters are reminded to check their leases carefully as some of these responsibilities may have been transferred to them. The snow ordinance in Iowa City states that the entire width of a public sidewalk must be cleared of a 1 inch or greater snowfall within 24-hours after the snow has stopped. The Department of Neighborhood and Development Services receives complaints and investigates to verify that the snow and/or ice has not been removed. If the inspector finds that the public walk has not been cleared, the property is posted and a letter of violation is sent by regular mail to the property owner. An inspector will return to the property approximately 24-hours later, and if the property has still not been cleared, the City hires an outside contractor to clear the snow and the property owner is charged that amount plus a $100 administrative fee. If there is a second violation confirmed during that same season, the City can immediately clear the sidewalk without notification to the property owner. Complaints must be specific and must include an actual address in order for City staff to respond. Residents can view the complaint tracking map to see if a report has already been filed against the property in question, or to view properties that are being investigated by the Neighborhood and Development Services Department due to complaints from the public. The enforcement period of the Iowa City weed ordinance is year round. If the Department of Neighborhood and Development Services receives a complaint about an inoperable/obsolete vehicle, an inspector is sent out to verify the complaint. The inspector will post the vehicle and the property which gives the property owner 48-hours to move the vehicle, if the vehicle is still there after 48-hours it is then posted with a "Notice to Abate," which informs the property owner that they have 10-days to move the vehicle or the City will tow it off of the property at the owner's expense. All vehicles not parked on streets must park on approved, hard surfaced spaces only. Parking on grass is not permitted, and may result in a $250 citation. Parking on gravel areas is approved only if that area has been continuously maintained as gravel parking. Do not assume that your gravel parking is existing non-conforming. Check with us to be sure, 319-356-5120 or 319-356-5130. The creation of gravel parking is not permitted. Police will ticket and may tow vehicles that are parked across public sidewalks and driveway approaches. Section 17-5-19X-1 of the Iowa City Housing Code prohibits a dwelling to be occupied by a number of persons greater than allowed by the zoning ordinance. Every residential dwelling within Iowa City, regardless whether it's owner occupied or rental, has a maximum occupancy limit for roomers depending on, among other concerns, the zone the property is located in and the number of conforming off-street parking spaces provided. Every rental unit within in Iowa City has a maximum unrelated persons occupancy limit. This number can be found by viewing the property's rental permit. Each unit within the rental structure will have its maximum occupancy posted on the rental permit. Over-occupancy is an issue that seriously impacts neighborhoods. First offense fines are $750 and $1,000 for repeated offenses. The solid waste ordinance states what kind of containers can be used, where they can be stored, and when they can be placed and removed from the curb. If waste is not stored properly at the curb, it will not be picked up. If that waste remains at the curb for longer than a day, the Solid Waste Division may remove the waste and bill the property owner. For trash and litter in yards, the Neighborhood and Development Services Department will attempt to investigate the complaint within 24-hours. If a violation is found, the inspector will notify the property owner by phone or written notice to remove the trash. If the violation remains for more than 48-hours after notification, a citation of $250 may be issued.